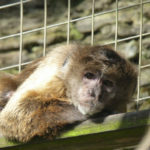 Banjo was born at an Animal Care College as the first of four youngsters, who were re-homed here at Wild Futures Monkey Sanctuary in 2012. Banjo’s mum Sue is a high ranking member of the group and so Banjo has inherited his position from her. He is a naturally confident young male who already shows a great interest in group politics. Banjo’s life is all about games and fun with little sister Roccita. 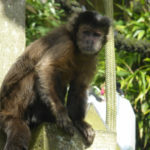 Betty is a member of the Sanctuary’s only natural family group of capuchins, who arrived here at the Monkey Sanctuary in March 2012. Despite being a low-ranking member of the group, Betty is good friends with high-ranking group member Sue. Betty is very smart and she knows how to catch the eye of her carers at feeding times to ensure that she doesn’t lose out on any treats! 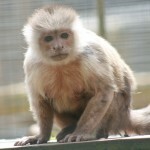 Billy arrived at Wild Futures’ Monkey Sanctuary in January 2012. He is a very quick learner, and is also very brave and very friendly. Not self pitying, when told off by the other monkeys he doesn’t sulk but patiently waits to be able to play again. 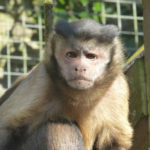 Billy still has a lot to learn about being a monkey and is always looking for reassurance from the older monkeys. But he has great potential and will hopefully one day become a kind and successful member of the group. Boo Boo (or Boo for short!) 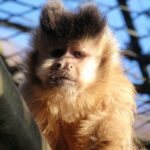 was living in a family’s garden until she was rescued by the Monkey Sanctuary. 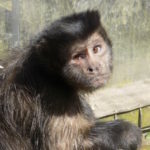 Boo has settled well into her social group here at the Monkey Sanctuary, making great friends with fellow capuchin monkey Billy. The two of them enjoy playing together, but also relaxing on their own. Boo Boo has a well-known food call among all the monkeys at the sanctuary, and she is often the first to let everyone know that food is on its way! Chanel was taken from her mother as a tiny baby and kept as a pet with another monkey named Coco. 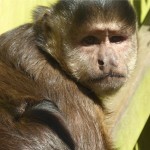 On arrival here at the Monkey Sanctuary, Chanel was underweight and frightened. Chanel has since improved physically and psychologically and she now flourishes with the specialist care she receives. Her friend Coco has since passed away, but she now lives happily in a social group and has formed a very strong bond with Gucci. 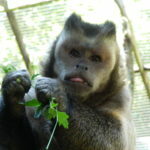 Charlie Brown came to the Monkey Sanctuary in 2005. His history is largely unknown, but we do know that he was kept as a pet. On arrival here he appeared to be a healthy young monkey, but his psychological state gives us clues that his previous life was not a happy one. He has a gentle and kind character so is often chosen to help new monkeys learn how to socialise, and he just loves meeting these new arrivals and teaching them how to play. 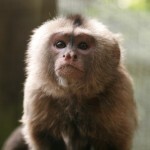 Elvis is a big alpha male in the Sanctuary’s first and only natural family group of capuchins. He and his family arrived at our Sanctuary in 2012 from an animal care college. Despite his size, Elvis is a gentle giant in many ways and often lets his alpha female, Sue take control of disciplining the group. 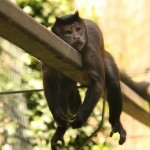 Although he lives in his own social group, he also loves to chat to his monkey neighbours. 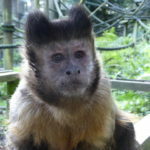 Frosty was our first ever rescued capuchin monkey. He arrived here in 2001 after we were contacted by the agricultural college that were keeping him. 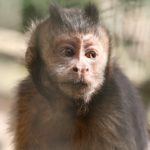 He lacked social skills on arrival, having being deprived of a natural social environment, but he is now the leader of his very own group of capuchins. 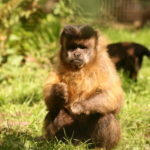 He is a real character and very popular with both monkeys and humans alike. Gizzie arrived at our Sanctuary in 2010 after being kept as a pet in a breeze-block outbuilding for many years. She just loves to snuggle up inside a cosy heated room in winter, but she also enjoys sunbathing and foraging in the greenery when the weather is warmer. She has formed a strong bond with capuchin monkey Josh and she doesn’t really care for humans, unless there is a chance of a grape reward! Grips arrived at our Sanctuary in early 2010. He was hand reared by his owner after the death of his mother and was fed lots of inappropriate sugary human foods. Sadly, this led to him developing type 2 diabetes. Grips will need insulin injections twice a day for the rest of his life to keep his condition under control, but he now enjoys having lots of space, trees to climb, and interesting things to do. His best friend is Kiwi, who he cuddles up with at bedtime each night. Gucci arrived at the sanctuary in 2011. Gucci has a cleft lip and palate, so it is likely that her mother didn’t receive the appropriate nutrition whilst pregnant with Gucci. Due to having been deprived of a natural social life, she can be an introvert character. She loves new toys and despite her insecurities, her social skills have improved. She has also managed to steal the heart of Lodi! 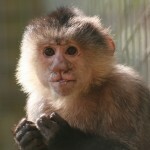 Jackie was initially thought to be a male and was sold into the pet trade by a zoo. When her previous owner contacted us to take her on, Jackie’s first change in her new life was a name change from Jacko to Jackie! Due to a poor diet she developed type 2 diabetes and needs daily medication to control her condition. 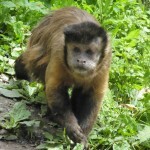 She settled in fantastically well and is now the much respected alpha female of one of our larger capuchin groups. 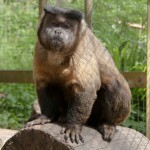 Joey was stolen from the wild as a baby and kept as a pet in wardrobe-sized cage for 9 years in a flat in Camden, London. Due to a lack of exercise, poor diet, cramped living conditions and lack of sunlight, Joey had developed severe nutritional bone disease leading to many irreversible disabilities. He is a truly resilient and inspiring character; stealing the hearts of all that meet him. Josh came to our Sanctuary in May 2010, after he had bitten and seriously injured his owner. He was removed by the police at his owners request and placed at an animal farm zoo nearby, until it was closed down by the authorities, who asked us to take him on. Despite the trauma he had suffered, Josh settled fantastically into his new life and has a cheerful and calm character. 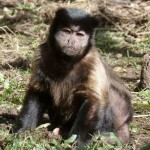 He is now the alpha male of his very own small group of capuchins! Kirsty arrived at our Sanctuary in April 2011 from a small private sanctuary that was closing down. She was soon integrated into a black-capped capuchin group and fell in love with Kodak, the big male in the group. She now spends her days socialising with her group and loves to forage for bugs and grubs amongst the lush vegetation in her enclosures. Kiwi arrived at our Sanctuary in 2010 after being kept as a pet in a breeze-block outbuilding for many years with her mother, Gizzie and half-brother, Grips. After just a few weeks of specialist care, her natural surroundings have allowed her natural behaviors to blossom; she loves involving herself in the monkey politics of neighboring monkey groups and can often be found shouting support across the enclosures! Lodi was captured in the wild as a baby and smuggled into Europe and was then kept as a pet in Spain. 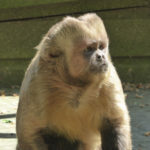 On arrival at our Sanctuary in June 2011, he was underweight and nervous, but soon made it very obvious that he was desperate to meet the other monkeys! Over the years however, he has learned how to be a monkey once again and now lives with Gucci and Chanel. He loves to spend every night cuddled up with them. Mickey arrived at the sanctuary in 2005. She is a tiny monkey and her stunted growth is likely due to a lack of nutrition when she was younger. Despite this, she settled fantastically well and is now a much loved member of her group. She enjoys a varied, healthy diet and loves to forage for her scatter feeds. She takes new arrivals under her wing in a grandmotherly fashion and has formed a strong bond with Tanya. Morwella arrived at the Sanctuary in March 2012. Morwella has spent around 25 years as a pet, and is now enjoying life with her new monkey friends. She has settled into her group extremely well and it is Morwella who is always quick to initiate and show solidarity with her group members – against the carers! We have discovered her to be a real character in possession of a true wild spirit – despite her long life as a pet! Mr Monkey is a little ball of energy! 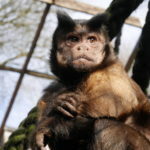 A hybrid-breed capuchin monkey rescued when his owners emigrated to Portugal and were unable to take Mr Monkey, as Portugal, unlike the UK, has outlawed the keeping of primates as pets. 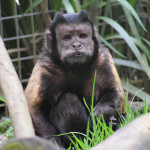 He now leads an active social life and we hope to introduce more rescued capuchins to his social group so that Mr Monkey will have more friends to play around with! Roccita was born at an Animal Care College, to parents Sue and Elvis, and was initially named Roccy. When the family group arrived at the Sanctuary in March 2012, Roccita was still nursing from, and often riding on the back of, her mother Sue. Growing up in a group with other youngsters has taught Roccita a huge number of essential social skills. We are looking forward to see how her personality further develops. 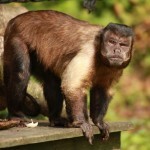 Sue is a member of the Sanctuary’s only natural family group of capuchins, who all arrived in March 2012. She is the mother of Banjo and Roccita. Sue enforces her high ranking position by keeping everyone on tight reins. 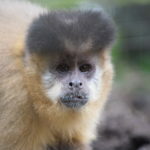 Sue is always at the front row, backing alpha male Elvis, when the capuchin groups engage in ear piercing group-greetings and appeasement sessions between enclosures. 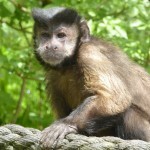 Tanya is a shy, female black-capped capuchin. She is reserved around humans and prefers the company of her monkey friends. She is currently living in a large, successful social group and is mostly found in the company of Jackie, Frosty, and Mickey. Tanya is slight of build but has a powerful voice with which she lets her carers at the Sanctuary know when she is unhappy with! 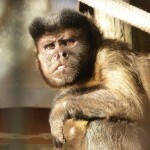 Tam was born in 1996 and was sold into the pet trade, along with his brother, when he was still an infant. Sadly, Tam’s brother died some years ago and he was left living on his own. Tam now enjoys having access to large, natural enclosures and has built up lots of trust in his carers. He has settled into a stable social group and loves to copy what the other monkeys are doing and follows them around everywhere.